Small Kettle Comparisons: 'Cos Travellin' Life Won't Do Without a Brew! Being English, one thing that I really miss on the road is a good cup of tea! When you’re staying in backpacker hostels and dorms, unfortunately, you forfeit the luxury of having tea and coffee making facilities in your room! So does one have to give up the luxury of a lovely hot cup of cha when one backpacks? If the Queen doesn’t have to, then neither should you! Having to stand up to refill your cup of tea can be one of the major inconveniences of a relaxing holiday, which is why it’s a good idea to consider choosing a cordless travel kettle like the T-fal Balanced Living Electric Kettle. Leave the kettle on the base to boil, and take it with you to your desired tea-sipping location. 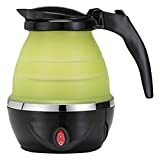 This sleek multipurpose electric kettle can be used to quickly heat up water for any number of purposes, with a locking lid and automatic-shutoff for your optimal safety as you travel. Compact and simple for packing, once you start boiling your water, stick around because you’ll be ready for tea in just a minute! The search for the best travel kettle includes thinking about the look of your new companion, and if you like stainless steel, generally, you will appreciate the Bonavita Mini Kettle. Besides looking great, the stainless-steel design will keep your kettle in great condition for years of travelling. Whether you’re camping or staying in a hostel, cleaning this kettle is super simple and won’t be a hassle. Don’t be fooled by this kettle’s charming compact appearance, it boils enough water for two hefty cups of tea, rather quickly! It’s time to spotlight another collapsible electric camping kettle, the Gourmia model. Whether you’re waiting to make a cup of tea or a bowl of oatmeal, your water will boil fast and you will be enjoying your treat, in no time. It can be easy to let your mind wander while traveling, but luckily for you, the Gourmia Travel Foldable Electric Kettle uses boil dry protection and will turn off if there’s no water left to boil. To make your travels as seamless as possible, use baking soda to clean the kettle before packing it, to avoid any lingering rubber smell upon use. Enough cannot be said about the perks of having a collapsible travel water boiler. The Yzakka Electric Tea Kettle is another model that folds down into a compact size, small enough to fit into any luggage, without taking up too much precious space. Smaller than an iPhone, this kettle will not even cause a second thought as you plan your packing. You’re ready to go right away with this Yzakka kettle, as it comes with a universal adapter! Set your kettle to boil and in five minutes, you will be enjoying your cup of tea or coffee. If you’re traveling with your car, then think about choosing a 12V travel kettle like the ALEKO CARKT12V Kettle. 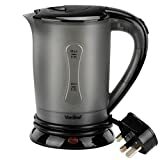 Eliminate the need to find an outlet and travel in a total self-reliant style with a kettle that will boil your water from the comfort of the driver’s seat, by plugging into your car’s cigarette lighter. This kettle can boil up to 1 litre of water at a time, and will help you stay awake during long road trips, as you’ll be able to make coffee whenever you want! This kettle takes a bit of time to boil water, so try to get going around 30 minutes before serving time. 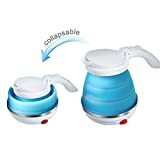 The Gourmet Gadgetry Travel Kettle collapsible model is the ideal mini electric kettle for travellers who are passionate about keeping their luggage to one bag! When not in use, this kettle folds down into a flatter and more compact item than it already is. You won’t even notice its presence in your suitcase. 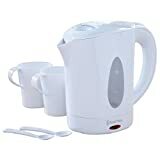 You will be able to use this corded kettle all over the world, heating up 0.8L of water at a time, resulting in your first two or three cups of tea for the day! Quick to boil, this kettle will aid an air of efficiency to your travels. When you imagine a mini kettle, what comes to mind? The Swan Travel Kettle maintains its compact status, while still holding close to half a liter of water at a time, enough to fill at least the two small cups included with the kettle. This small electric kettle can accompany around the world, as it operates on 110V to 240V, using a simple dual voltage system. Designed for your ultimate convenience and ease of use, this small kettle has an accessible power switch, locking lid, and keeps your safe with overheating and boil dry protection. Pack it in your suitcase, and set off! 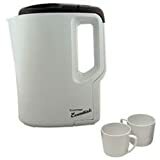 A bit larger than the previous option, this Lloytron Small Kettle holds up to 1 litre of water at a time and also comes with two cups so that you can drink tea and coffee wherever you find yourself. With universal voltage, you will never have to worry about finding yourself in a foreign country without your morning cup of tea again. The right travel electric kettle needs to get the job done, without needing a carry bag of its own, and the Lloytron does just that. Your water will boil quickly with this portable kettle, so you can relax right away after a long, tiring flight. Opening your new mini electric kettle to discover a pair of mugs and spoons inside is a lovely surprise, provided to you by the Russell Hobbs Travel Kettle. 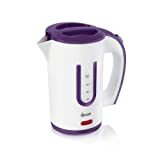 The combination of knowing that you will be prepared for teatime anywhere you go, and being able to pack as compactly as possible, make this small electric tea kettle a winner. Using this kettle will be super easy with its universal voltage and removable, washable filter for simple maintenance. Switch this kettle on, watch the water boil quickly, and enjoy your tea with your travel companion! Another small travel kettle designed to store the included teacups, theVonShef Travel Kettle is a great option for you, if you appreciate a sleek aesthetic. As with any practical mini travel kettle, this one is suitable for use abroad, with no issues. The wide spout on this kettle creates a smooth filling and pouring process, eliminating your need to worry about spilling accidents. 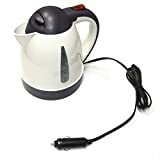 You will have no trouble fitting this into your suitcase or bag while packing, but you might want to consider bringing an extension cord with you, as this kettle’s cord is quite short. So there you have it! There’s no need to go without your daily coffee or tea just because you’re living a travelling lifestyle. With travel kettles, you can have your cake and eat it too, with tea, of course! Spend some time thinking about your travel conditions and needs, and you will be sure to find the right mini kettle for you! Pin it to your Pinterest Board for others tea drinkers to see!